12-9-13 – Where Did The Ice Go? Hoping for a good bite, I made a trek to meet up with a few buddies at a location that has been fishable recently. Upon our arrival, we realized that the plank I had brought wasn’t going to cut it. The ice had taken a hit with the recent rain and snow. What was the next best option? Breakfast of course! We hit up a local diner to pass the time and try to come up with a back up plan. With a full belly and a fair amount of snow on the road, we made a round about drive home to check on some ice in the mountains. Through work I have put in a fair amount of time on a medium sized body of water that is loaded with pumpkinseed. With intentions of finding them we punched a few test holes revealing 8″ of black ice! With great ice under our feet, we roamed over a 15-18 foot basin looking for aggressive fish. 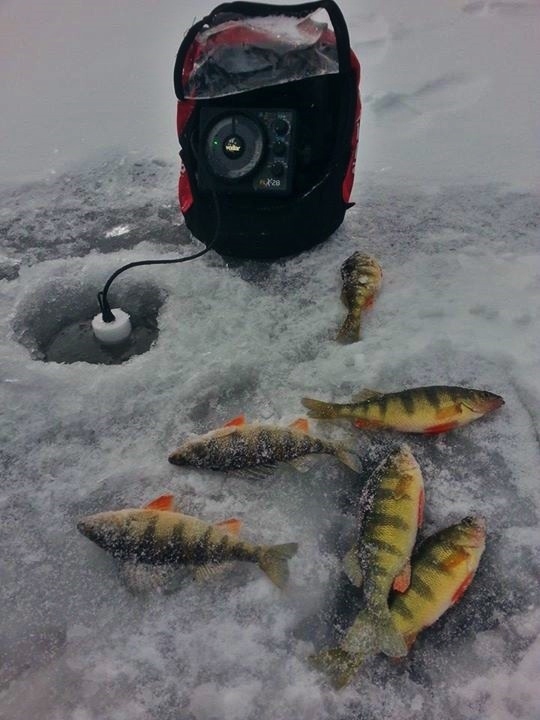 Using our normal method of run and gun to locate them, it didn’t take long to put a few perch on the ice. The more we moved the less fish we found though. Thinking that the fish might have designated travel corridors, we set back up on the holes that proved successful. Every few minutes fish would come through schooled up allowing us to pick a few before the next pod pushed through. 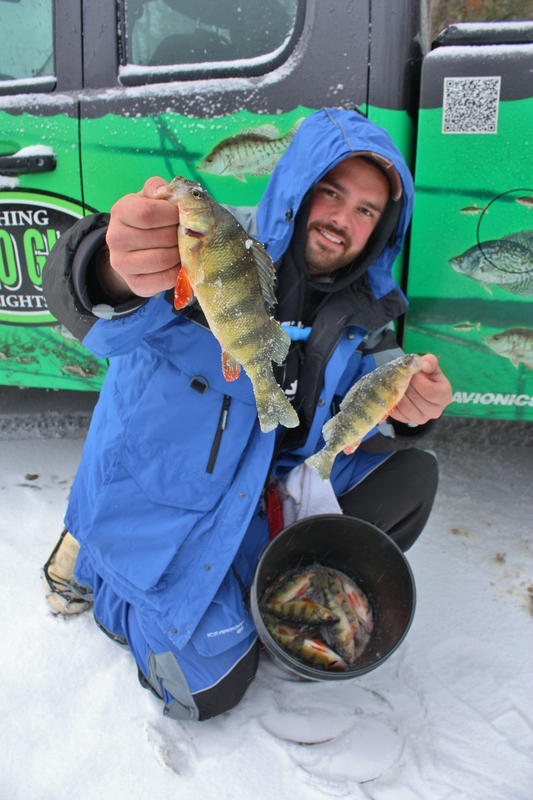 Mainly we caught perch but a few pumpkinseed and largemouth bass came to play as well. With more snow falling and reports of poor road conditions, we packed up our rigs with some dinner in our pails.